Using just one or two hashtags is woefully inadequate for brands trying to build their following on Instagram, but using 25-30 hashtags is also unpopular with users. Generally speaking, you’ll want to use more than 6 or 7 but fewer than 25. Better yet, be sure to separate your hashtags from the caption by inserting a few lines or several period points to push your hashtags out of the immediate caption area of your post. That’s what viewers see while scrolling through a feed before actually clicking on your post to read the remainder of the caption, where your hashtags will be hiding. Perhaps you’re not using the maximum 30 hashtags but you’re still not getting the results you were hoping for with your Instagram campaigns. If that’s the case, then you might not be diversifying your hashtags enough. If you’re using the same bulk of hashtags for a majority of your posts, then you’re really limiting yourself to Instagrammers who search only for those specific hashtags. Instead, consider casting a wider net by incorporating at least 4-5 new hashtags into each post to help make sure you’re getting new eyeballs on your photos each time. 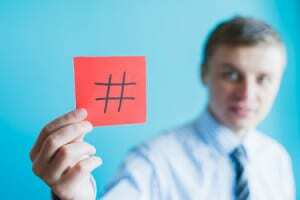 Why settle for pre-made hashtags when you could get a leg up on your competitors by creating your own hashtags that audience members can use in their own posts? User-generated content campaigns are enormously valuable for brands because they give you access to free, word-of-mouth marketing. Instead of simply using your brand’s name as a hashtag, create unique and fun hashtags that will stand out and encourage other Instagram users to participate. This is particularly useful for running contests and giveaways on Instagram. There are tons of hashtags geared towards individual days of the week – #ThrowbackThursday (#tbt) or #WoofWednesday – as well as seasons and holidays. If you’re not creating specific marketing campaigns targeted to these different dates, then you could be missing out on valuable opportunities to score more viewers for your Instagram content. To avoid this mistake, be sure to research which daily hashtags are relevant to your brand and discover which seasonal or holiday-themed hashtags would be useful for adding more variety to your posts and building a greater following as a result of this diverse approach.